By Allison Petty, Decatur Herald & Review. Reposted with permission of Herald-Review. 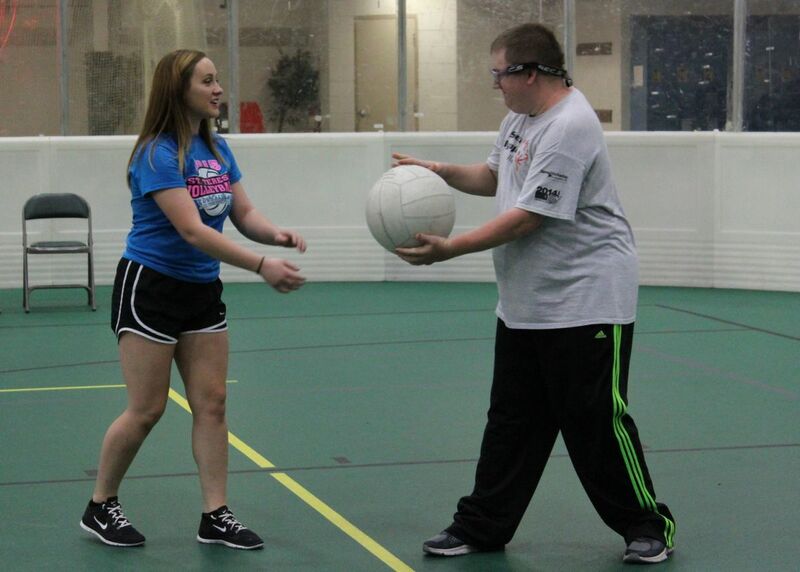 DECATUR – As they prepare for upcoming state competition, two Special Olympics volleyball teams got some help from Meridian High School players last week. More than 15 girls from the high school’s volleyball team worked through drills with the athletes during their practice time Oct. 5 at the Decatur Indoor Sports Center. In addition to serves and scrimmages, the hour included plenty of high-fives and laughs. 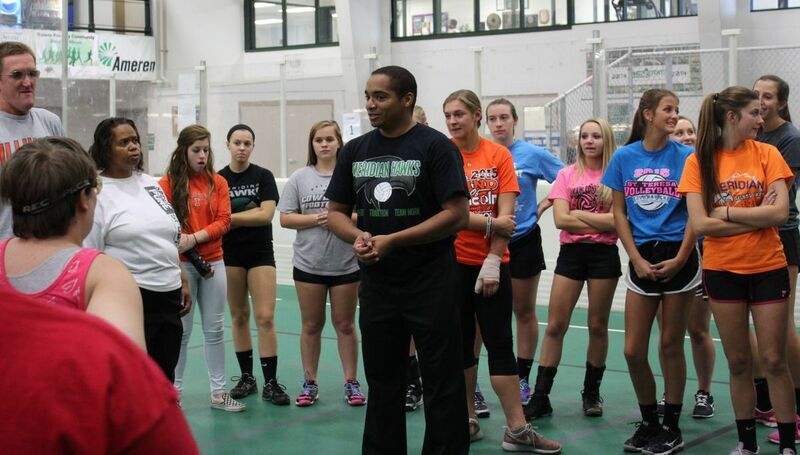 Meridian High School volleyball coach, Tony Holly, speaks to his players and Special Olympic Illinois athletes. The two teams, the Decatur Lions and Decatur Tigers, include a total of 13 athletes. They will travel to Rockford for the state competition on Oct. 24 and 25, a trip that also includes fun activities like a costume dance and dinner at a nice buffet, said Dana Floyd, Special Recreation Association supervisor for the district. Macken, 28, is looking forward to the state competition and plans to attend the dance as Batman. His mother, Tressa Short, said he also participates in bowling and monthly dances that the park district holds at the Knights of Columbus Hall for people with disabilities. He’s made a lot of friends, she said, and she never worries about his safety. Chelsea Getz, a 16-year-old junior at Meridian, said she previously loved her experience helping Special Olympics athletes through her softball team. In addition, as a “Yellow Hat” park leader this summer, she helped serve lunch to participants in the park district’s Camp I Can. There wasn’t any skill in particular Chelsea was hoping to teach her fellow athletes. She was simply hoping they’d have fun and learn “just the love of the sport, really,” she said. Sophomore, Bailey Felter, hands the ball to Decatur Lions player Ron Colvin. The joint practice included work on serves and passing through a variety of drills that Holly said are familiar to his team. The girls and Special Olympics athletes seemed to blend seamlessly and even gathered in small groups to take pictures together afterward. Holly said he wasn’t surprised that his team took so well to the joint activities. 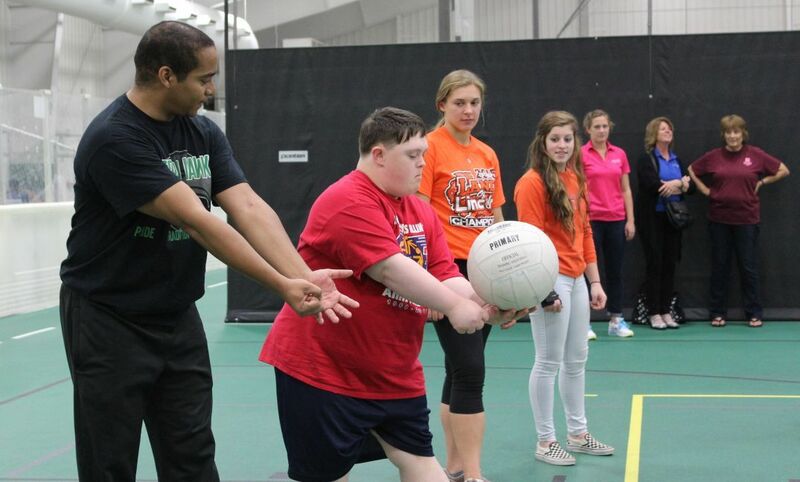 The Special Olympics volleyball team members do not pay to travel to the state competition, Floyd said, but they are raising money to help pay for the trip. On Monday, their practice will include a Serve-a-Thon, where athletes take pledges for how many serves they can get out of 20. To donate, contact Floyd at (217) 429-7750.